Cops working on a hot summer’s day who find themselves, in the course of their duty, staring down the barrel of an assailant’s gun have two reasons to sweat. However, if a new item of clothing developed by materials technology company Empa becomes widely used, it may help them to keep cool in the most demanding of situations. 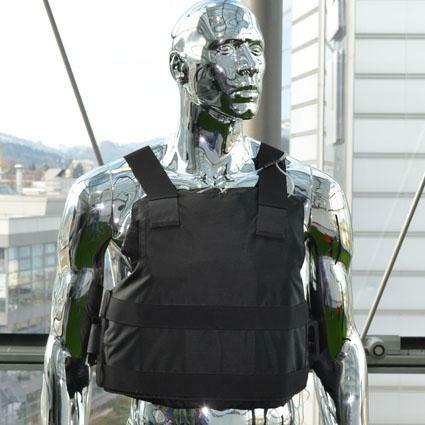 Scientists at the Swiss company have come up with an air-conditioned bulletproof vest designed to keep its wearer cool and comfortable as they go about their work. The bulletproof vest incorporates an integrated cooling system consisting of special water-filled pads and a number of small fans. As the water evaporates it cools its surroundings, while the fans help to distribute the cool air around the wearer’s body. Not surprisingly, Empa described the task of designing its special bulletproof garment as “quite tricky.” Unable to find any suitable miniature fans on the market, it ended up having to design and build its own. It also had to deal with the issue of water leaking from the pads, something which initially happened a lot through the stress placed upon them by the garment’s wearer. Finally, Empa scientists wanted to make it easy to refill the pads once all the water had evaporated – something which will be necessary after around three hours of continuous use. To solve the problem, they came up with a quick-release fastener. “During the same pit stop, the mini fans can be exchanged for those with freshly charged batteries. Then the vest is ready once again for three to four hours of duty,” the company said. According to Empa, its bulletproof vest is much lighter and cools more effectively than any other similar systems currently on the market. Officers working for Zurich’s police department have reportedly tested out the vest, giving it the green light after wearing it on several hot days. Empa says the technology can also be used for protective suits worn over normal clothing and even for rucksacks. If the vest really is as lightweight, comfortable and effective as its maker claims, it could well become the bulletproof garment of choice for police departments everywhere, helping to take the heat out of some potentially sticky situations. iCloud refresh: Does Apple need to compete with social media?